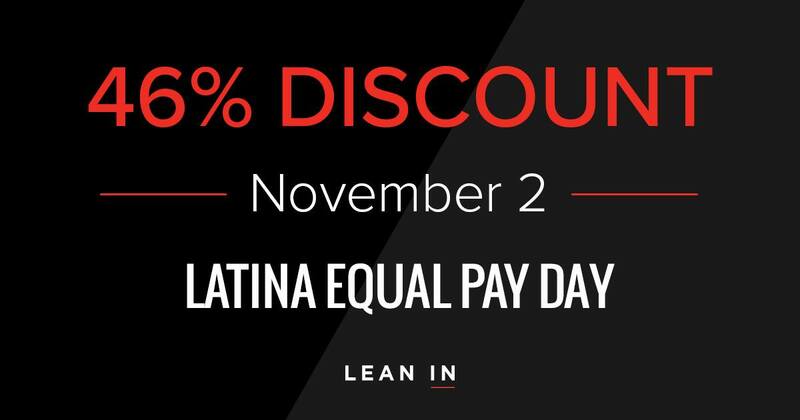 The businesses below have special offers in support of November 2nd, Latina Equal Pay Day. Yoga Initiatives 8-Week Yoga, Mindfulness and Compassion Program. Offering 46% discount on one class. Peak State Software is offering 46% off of a custom website. Visit their website and contact them for the discount. OPAL is offering a special Happy Hour LeanIn Libation on November 2nd! St Stephens Green is offering a special Happy Hour LeanIn Libation: Ask for the Miracle Margarita! The Counter will offer 46% off a full order of shoe string fries. Mountain View Chamber will offer 46% off a promotional table at either the TriCity Mixer in January or Silicon Valley XPO in April. Save 46% with Mas Wireless. They will offer a FREE phone with purchase of a line & the $25 activation fee will be applied to an accessory. Boutique 4: 46% off their gorgeous jewelry all day! Nutrishop is offering 46% off HER Essentials Women’s MultiVitamin on November 2nd. PassionFit: 46% off all purchases on Thursday, November 2nd for my drop-in, 5, 10 and 20-class packages for Passion Fit fitness and dance classes in Los Altos, CA. You can enter the promo code: EQUAL PAY at checkout on my website or mobile app, which you can download on the Google Play Store or Apple App Store. Frankie, Johnnie & Luigi Too! is offering their world famous Sausage Bread appetizer at 46% off! Thank you to the local businesses who are supporting this awareness!